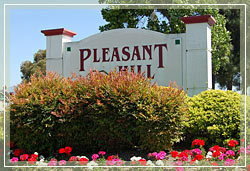 Located in the East Bay of the Greater San Francisco Bay Area – and in Contra Costa County – the city of Pleasant Hill truly is a very pleasant place to live and work! Home to both College Park High School and Diablo Valley College, the stunning characteristic of the area is its areas of undisturbed wilderness and woodlands, offering area residents parklands, hiking trails, and naturally beautiful landscapes in which recreation and exercise are easily enjoyed. Pleasant Hill is named such not only because of its stunning terrain and landscapes, but also because of the area’s mostly-pleasant year-round weather. While residents can enjoy naturally mild weather most of the year, the area is particularly prone to unexpected weather and temperature changes, and flash freezes and heatwaves. This is why it is so important to have a heating and air conditioning service company on your side, if a heating and cooling emergency arises during one of the region’s infamous surprise temperature changes. At ACS Air Conditioning Systems, we work very hard to be YOUR Pleasant Hill HVAC Systems partner. We also offer solar solutions to energy issues our customers may have. Solar power is clean, renewable, and cost-effective. Call us today to learn how solar can help you to lower energy costs, and be more eco-friendly!